Located deep in a tropical forest in Koh Phangan. The Half Moon Festival is the talk of the town for a while after each party, it is a celebration of the moon as it gets closer or further from a full moon. The Half Moon Party takes place every 2 weeks; one week after and one week before the Full Moon Party. The festival is one of three moon celebrations which officially make Koh Phangan the ultimate party island, it has people traveling from all around the world to experience its vibrant, lively energy. 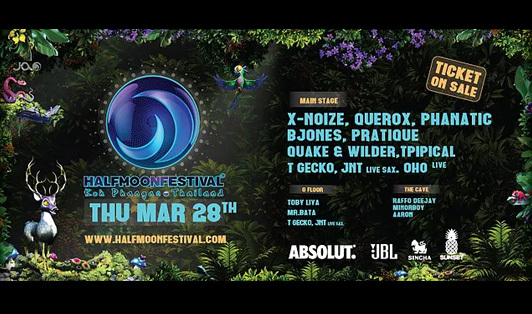 The Half Moon party is diverse when it comes to music, as it suits all kinds of travelers and party people, from R&B, soul, and funk to mainstream music and electronic beats getting the party going. Also, the festival is more organized and secure than the Full Moon Party. However, it still won’t hurt to take caution. This is one of the coolest and most popular events in Thailand, it is definitely special in all the right ways.